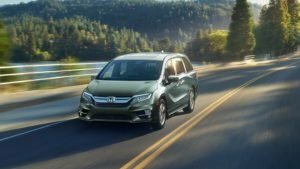 The all-new 2018 Odyssey will make its debut at dealerships nationwide this spring. 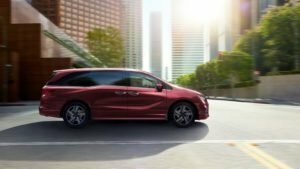 The completely redesigned Odyssey will feature new powertrain technology, sophisticated styling and showcase new innovative features, making it the ultimate in family-friendly design and packaging. Inside, the new Odyssey features high-grade materials including a soft-touch instrument panel. The driver’s meter features a new 7-inch, full-color TFT display, and in the center of the dash there is a 8-inch high-resolution Display Audio touchscreen interface. In upper grades, stain-resistant leather first- and second-row seating surfaces and door trim and black carpeting and black seatbelts are designed to conceal stains, while a new grooveless tambour lid on the spacious and versatile center console resists the accumulation of crumbs and debris. In-vehicle connectivity is taken to a whole new “family connectivity” concept. Old-fashioned family connectivity – sometimes called a conversation – is made easier than ever with the quietest cabin in the class, and is augmented with a multitude of new connected-vehicle features and technologies. Additional new standard and available features include LED headlights, heated and ventilated front seats, heated side mirrors and steering wheel, auto high-beam headlights, rain-sensing wipers, lane watch, blind spot information, front and rear parking sensors, rear cross traffic monitor, electric parking brake with brake hold, three-zone automatic climate control, wireless device charging, multi-zone audio, Sirius 2.0, HD Radio™, and HondaVac® in-vehicle vacuum. A major innovation to family-friendly cabin seating flexibility is the Odyssey’s new Magic Slide™ second-row seat, easily reconfigurable for optimal passenger comfort, people- and cargo-hauling flexibility, and easy access to third-row seating – even when one or two rear-facing child seats are placed in the second row. 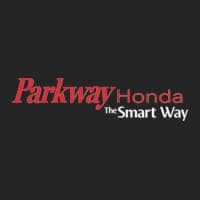 Article presented by Parkway Honda. Efforts have been made to ensure the accuracy of the information presented above, though pricing, equipment, or other details may change at any time without notice. For more information refer to Honda Canada’s website, or consult the vehicle’s owner’s manual.